Are you looking for the best entry level studio monitors currently out there? Look no further as the PreSonus Eris E3.5 may be exactly what you’re looking for. Being a beginner in any form of hobby or profession can be overwhelming, especially when devices can be expensive. Studio monitors tend to be pricey. As a beginner you don’t want to fork out too much money straight away on equipment until you’re past the newbie stage of sound engineering and music production. 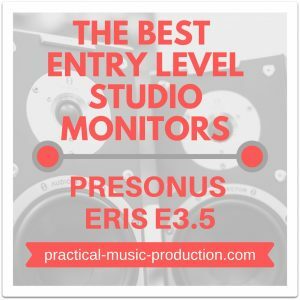 Let’s take a look at the PreSonus Eris E3.5 studio monitors and what they can do for you. 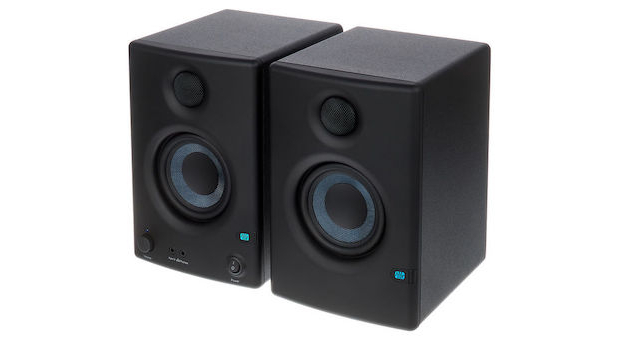 The PreSonus Eris E3.5 studio monitors are a pair of multimedia speaker monitors that can be plugged into any electronic device, such as a PC or laptop, or to an audio interface in a recording studio. The monitors can also be connected to any smartphone or tablet. These monitors were initially released in 2017. PreSonus is one of the world’s leading brands in entry-level studio monitors, and the Eris E3.5 are the perfect pair to get you started making and recording your own music. The Eris E3.5 studio monitors can be used by both beginner and professional sound engineers to monitor audio for music, podcasts, and gaming. The speakers provide a crisp and clear picture of every element of your audio, so you can adjust and tweak it where necessary. The Eris E3.5 monitors are used in home studios around the world. Both professional and beginner musicians, engineers, and producers will find these monitors to be exactly what they need. There are also no added costs involved as they come with all the accessories you need to get things set up. If you’re a beginner DJ that helps their friends out with the sound for parties and functions, you can use these monitors to get the party started. But if you operate where there are many houses, you don’t want to upset the neighbours. These studio monitors can pack a punch, producing plenty of audio power, but without disturbing the peace of those around you. YouTubers need decent sound when they’re making their videos. Not having quality sound can make viewers frustrated which will sometimes result in them leaving your channel. If you’re making podcasts and YouTube tutorials then you need have the best quality audio to keep people engaged. YouTubers can use the Eris E3.5 studio monitors to adjust their audio to improve their video quality. After making the most of your sound, you’ll be be able to impress visitors a lot more and turn them into subscribers to your channel. These monitors can also be used by game developers to add and edit music and sound effects. Game players can also hook them up to their consoles to get excellent playback of the game’s audio. Students who are studying film can use the Eris E3.5 monitors to edit their video audio and sound effects. Transmitting sound for work and school presentations for a small audience has never been easier. You can present your projects by connecting your monitors to a microphone via an audio interface, and adjust the sound accordingly so your audience can hear you clearly. Another good idea would be to provide ambient music while doing seminars on various topics, or you could provide sound effects for stage productions. You could also simply add some audio elements to your presentations using these monitors. These monitors are probably not ideal for those who aren’t interested in making and producing music. If you’re looking for simple speakers so you can listen to music on your computer then you could purchase a pair of Logitech computer speakers which are a lot cheaper and less technically involved. Neatly packaged and protected, the Eris E3.5 studio monitors come with a red and black cable which connects the two monitors together. In the box you’ll also find an RCA cable that connects the speakers to your PC or laptop. You also get additional foam pads that you can stick to the bottom of the monitors. These help reduce vibration on hard surfaces. 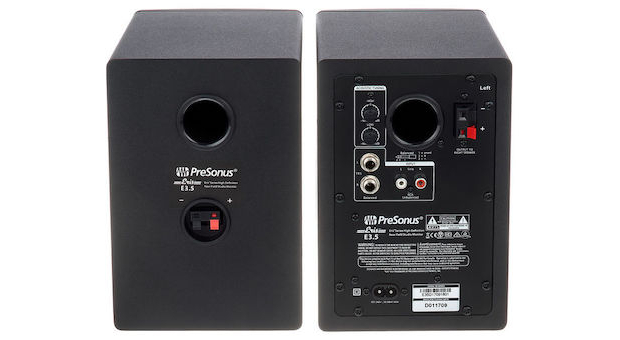 PreSonus also provides you with an extra cable that can be used to connect the speakers to your smartphone or tablet. It’s also possible to use balanced TRS cables with the monitors but unfortunately, these don’t come as part of the package. For a full unboxing breakdown, take a look at this video. 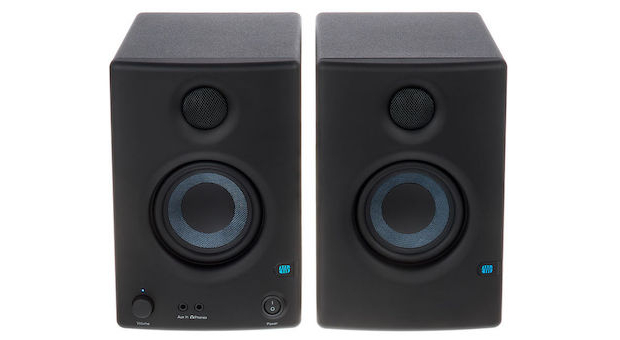 The Eris E3.5 studio monitors are housed in solid and durable black casing. The monitor’s tweeters (tweeters emit the higher-frequencies) are 1″ in diameter and are protected with a metal mesh cover. The woofers (responsible for emitting lower frequencies) are 3.5″ in diameter and made from Kevlar (which is a high-strength synthetic material). On the front interface of the left speaker, you can find an auxiliary port that allows you to plug the monitors into a computer, smartphone or tablet. There’s also an integrated on/off switch, a port for headphones, and volume control. On the back are all the ports to connect your speakers to your other devices, such as an audio interface. There are also two controls to acoustically tune your high and low frequencies. The best thing about this product are the Kevlar woofers. It’s a surprising feature on a pair of monitors that are so inexpensive. These monitors are also lighter than most models in terms of weight, but even though they’re small in stature they make up for it with their high-quality sound. Another great feature is their compact size – you can set them up anywhere and they won’t take up too much space. They’re very portable so you could take them with you to practical classes if you’re a student, teacher, or professor. You could even take them on holiday or business trips if you really wanted to. Setting up and installing these monitors is quite easy and can be done by anyone who follows the instruction manual. All you have to do is connect the two speakers at the back with your black and red speaker cable. Connect the monitors to your computer or audio interface, and then plug the monitors into a power supply. Test the monitors by playing different music and sounds through them. Try changing the treble and bass settings and adjust them to your preference (although try to keep them as neutral as possible). Use the controls on the back of the monitors to adjust your low and high frequencies and keep testing your sound with each slight alteration. To get the best sound out of your E3.5 studio monitors may involve a bit of tweaking. If you’re not sure how to get started with this you can watch the below tutorial on what adjustments you could make. The Eris E3.5 studio monitors may not be for everyone. If you’re looking for an alternative pair of monitors that has all the features of the E3.5, you could take a look at the Mackie CR3 model. For the same price as the E3.5, you can get the Mackie CR3. The build quality of these monitors is fantastic and they have a very cool professional matte exterior with green styling, as well as LED lighting around the volume control. On the monitor’s front interface, you have an auxiliary port where you can plug your PC, laptop, smartphone or tablet, along with a port to plug in your headphones. On the back of the monitor, you’ll find all your input ports for TRS balanced or RCA unbalanced connections. You’ll also find the power switch. The size of these monitors are quite small as well which means you can fit them into almost any studio space. These monitors are also advertised as multimedia speakers that can be used for games, videos and music. You can use them for making and producing music as well but they may not be as ideal as the Eris E3.5’s. Now that you have a clear idea of what the PreSonus Eris E3.5 studio monitors can do for you, you’ll have no trouble in setting them up in your studio. The physical size of the monitors mean that they can fit into any space and are ideal for smaller home studios. These monitors will give you a true and clear picture of what your music sounds like and are the best entry level studio monitors around. So if you’re just starting out and you’re on a limited budget, but still need high-quality sound, why not give these a try?